I loved this collection of canned meats from around the world. I've already gone on record as a haggis lover. I've also consumed a Vienna sausage or two. But the photo above makes me violently ill. How far would the rest of you go? Bugs? Lambs' tongues? Where do you draw the line? Also, I've been a bit busy lately, so I've been posting a little less frequently. (And I've been slow to answer emails and post comments as well.) But I should be back up to regular speed pretty soon! I draw the line at spam. Urgh, spam. I'm not a canned meat person at all. MY POOR CHARLES AND CHICKPEA!! Btw, remember at Symphony Space when the host was singing this creepy rhyme? hahaha I just thought of it but I can't remember the first line...all I remember is something about "little boys and girls" and "play" and "time to put our toys away..."
thats disgusting. but it makes me laugh. like meat pudding, and the "All day Breakfast"
And ive opened a can of quid in its natural ink- its smelled so bad, my friend threw up. ewwww!!! i knew something gross was coming up, after that super cute sad panda!!!! who would buy REINDEER?????? SCORPIONS?????? yum. Exactly HOW big is the can? I've eaten lamb brains, liver, kidneys and paunch (stomach). And I remember someone askingme whether I'd like chicken livers. !_! Thumb Biter: Aww, I feel sorry my my darling hens too. But now...if they be naughty, I can say "I'll stuff ya in a can!!" Muwahaha. They like to poo a lot. Ms Miller, were you busy at the Book Expo America? whoa wait I missed this...YOU EAT HAGGIS?? Eeeeeeww!!!! Attempting vegetarianism! Totally off topic, but I was just in D.C. and I went to a very creepy (but very cool) museum: THe National Spy Museum! Check it out! It reminds me of a scene it "The Canning Season" by Polly Horvath; they're in a general store and see...a chicken in a can (shocker, considering the topic of the post :P). They hold it up and one of the characters says, "Who buys a chicken in a CAN?" But I personally think it sounds gross. 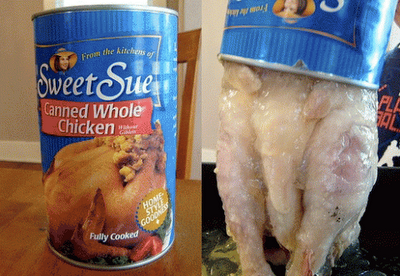 Canned things are (often) much less tasty than fresh. And I also think it is weird. last day of school on friday!!!!!!!!!!!!!!!!!!!!!!!!!!!!!!!!!!!!!!!!!!!!!!!!!!!! i will have a life again!!!!!!!!!!!! ewwww! really, who in their right mind would EVER BUY THAT when you can purchase a perfectly FRESH, healthy chicken???? I've seen squid "in natural ink" at the Asian food store. I've had deep fried squid, and it was AWESOME! Food being gross is a cultural thing, in my opinion. I don't mind the wait in posts as long as you keep writing them! Also, I agree w/ Reel Dancer. EEEEEEWWWWWWWW! PLEASE PLEASE PLEASE!!! MAKE KIKI STRIKE #3!!!!!!!!! The picture of the canned meat made me gag. The only thing I eat canned is soup. Gossip: Have You Been a Victim?